The lights go out, the music blasts and screams erupt. Everyone is in a frenzy in an attempt to see as much as they can, and the tears run. The concert has begun. 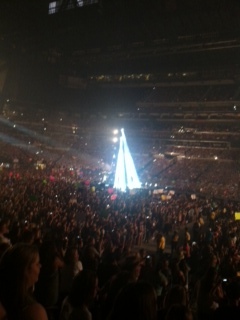 On July 31st, One Direction took Indianapolis by storm in a way no one could have expected. I attended the concert, and after seeing this band for the third time, I can say that I am always more than impressed by their talent and ability to entertain. The show opened up with a song off their most recent album, Four, called “Clouds.” It was upbeat and the perfect way to get the crowd pumped up. One would expect the performance to be less impressive seeing as they just lost their fifth band member, Zayn Malik, but they did not fail to absolutely knock everyone’s’ socks completely off. “I don’t even like the band and they impressed me,” said Sydney Shurman, 12. By far the best part of the concert was when they performed their new single, “Drag Me Down,” live for the first time. The song has a catchy beat, and to say that the vocals of these four beyond talented young men are impressive would be an insulting understatement. This song will be featured on their new album, which is yet to be named. 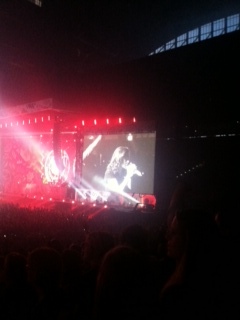 The concert was a great experience and I recommend seeing One Direction live. They were entertaining and it was obvious that they genuinely wanted to be doing what they were doing. They even thanked the crowd multiple times just for being there. I left the concert that night with one of feeling like I had had the time of my life. Seeing them again in the future is definitely something I am looking forward to. Niall Horan, Harry Styles, Liam Payne and Louis Tomlinson rocked our state’s capital and I am grateful that I was able to experience it.